THIS is the fall breakfast you need! This Overnight Pumpkin French Toast is so easy — you can make ahead for holiday gatherings and brunches and bake together in one pan! Naturally sweetened and made with real ingredients. So I shared a pumpkin recipe on my Facebook page in the middle of July, just to test the waters, and you all went positively nuts for it (in a good way), and I was a little flabbergasted. I thought for sure you would revolt and ask me why I wasn’t posted more ice cream or popsicle recipes, but it was the contrary. You claimed that it was never too early for pumpkin and — in fact — you enjoy it year round! Sure, I do my Food Blogger Duty to bring you some awesome pumpkin treats (Double Chocolate Pumpkin Oreos, Pumpkin Caramel Pecan Naked Cake, Pumpkin Spice Latte Blondies….) in the fall, but I just do not yearn for it like some most people do. And my Panasonic Steam Convection Oven! If you guys missed this Healthier Baked Cinnamon Roll Pancake from April, (a) shame on you, and (b) you need to check it out! 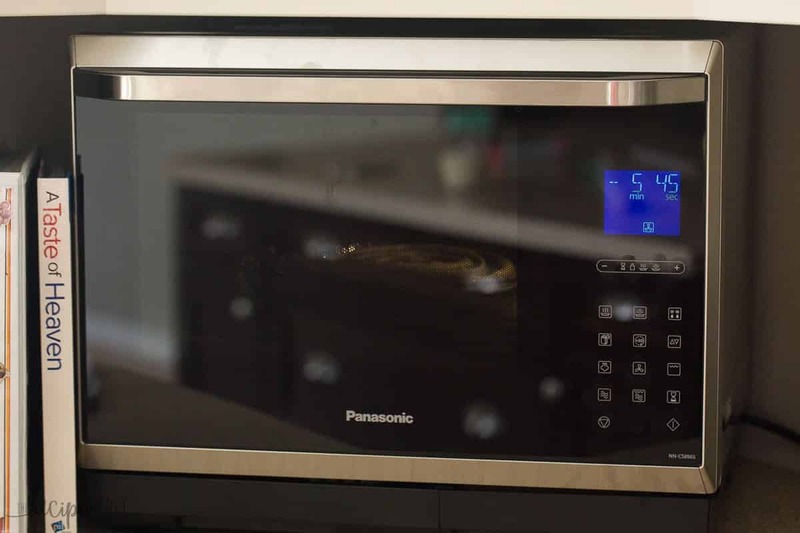 It is one of my favorite breakfasts of all time, and you can find out more about the Steam Convection Oven from Panasonic if you hop on over. When I knew I was going to get a chance to share another recipe with you that’s made in this beauty, I right away wanted to do another breakfast recipe. With the holidays coming up (yes, they’re coming — and quicker than you think! ), make ahead breakfasts that you can bake and serve a lot all at once are essential. I, for one, do not enjoy slaving over a skillet flipping pancakes or french toast while everyone else eats! Tell me I’m not the only one. If you’re cooking for a crowd, you can easily fit 2 9×13″ pans of this French toast in the Steam Convection Oven, or steam some apples on another pan to top it with (see how below!). If you’re looking to serve more than 6 (or your 6 are very hungry! ), feel free to double the recipe and bake in 2 9×13″ pans or a sheet pan. I like to serve this French toast with some fresh fruit (and coffee…. because, well… coffee) for a well-balanced breakfast! Slice 2 firm, tart apples. Toss with 1 teaspoon cinnamon and 1 tablespoon brown sugar. 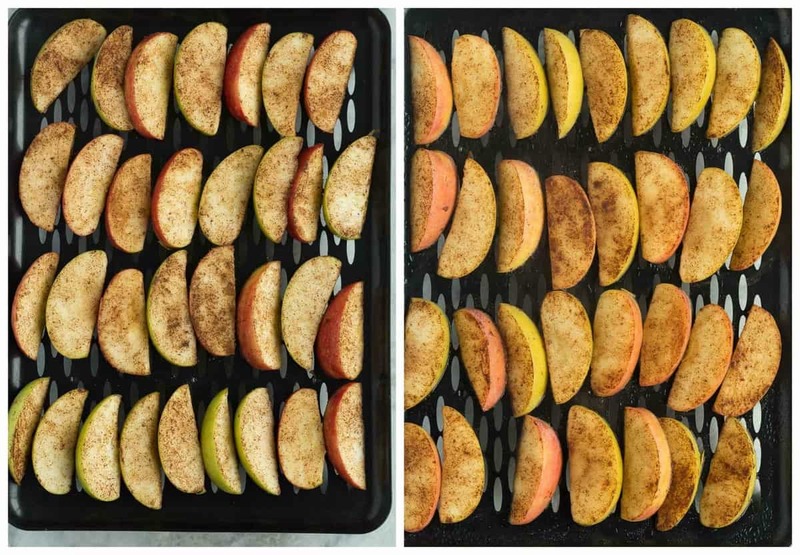 Arrange on rack, place on the glass shelf in the middle position, and cook on the Steam 2 setting for 10 minutes (for firmer apples) to 14 minutes (for softer apples). *This post is generously sponsored by Panasonic and I have been compensated for my time, but all opinions are my own. Thank you for supporting brands that make The Recipe Rebel possible! We had this again for breakfast this weekend! I wanted to try out a couple new techniques and have updated the recipe to reflect them. I’ve taken out the flip during the bake time to make things a little easier. Also worth noting is that when I made this this time, I totally forgot to add the maple syrup in it. We ate it with syrup, so we didn’t even notice and I didn’t think of it until it was totally gone. If you are looking for ways to cut back and you’re going to be topping it with syrup anyways, you can definitely leave it out! If you are not using thick sliced French bread, you might find you have extra liquid and your French toast is mushy. I really, really recommend thick sliced French bread for this recipe. THIS is the fall breakfast you need! 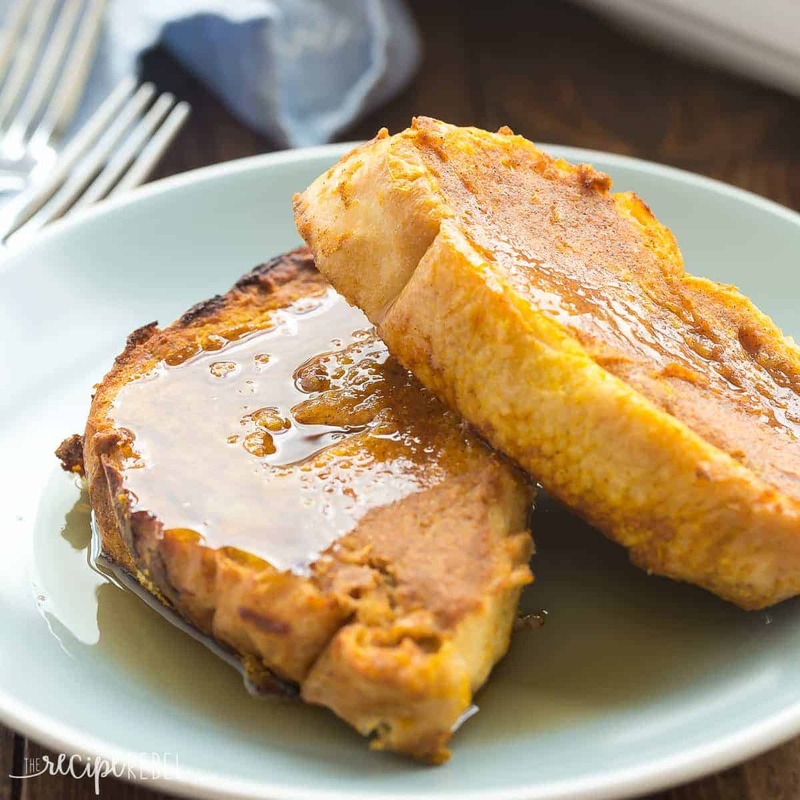 This Overnight Pumpkin French Toast is so easy -- you can make ahead for holiday gatherings and brunches and bake together in one pan! In a medium bowl, whisk together the eggs, milk, pumpkin, syrup, vanilla, cinnamon and nutmeg until smooth. Place French bread in a single layer in a well-greased 9x13" pan. Pour egg mixture evenly over top. Flip bread and move it around the pan to try to get the egg mixture evenly distributed. Cover in plastic wrap and refrigerate at least 3-4 hours or overnight. Preheat Steam Convection oven to 200 degrees C or 400 degrees F. Meanwhile, uncover your pan and flip the bread slices once. Bake for 30-35 minutes until outside is golden brown and insides are set (as per your preference). Serve with steamed apples, Greek yogurt, whipped cream, or additional syrup as desired. If you do not have a Steam Convection Oven, you can absolutely bake in your regular oven at the same temperature for about the same amount of time. Just take note of how set the French toast is at the 15 minute mark when you flip, and go from there! THIS is the fall breakfast you need! 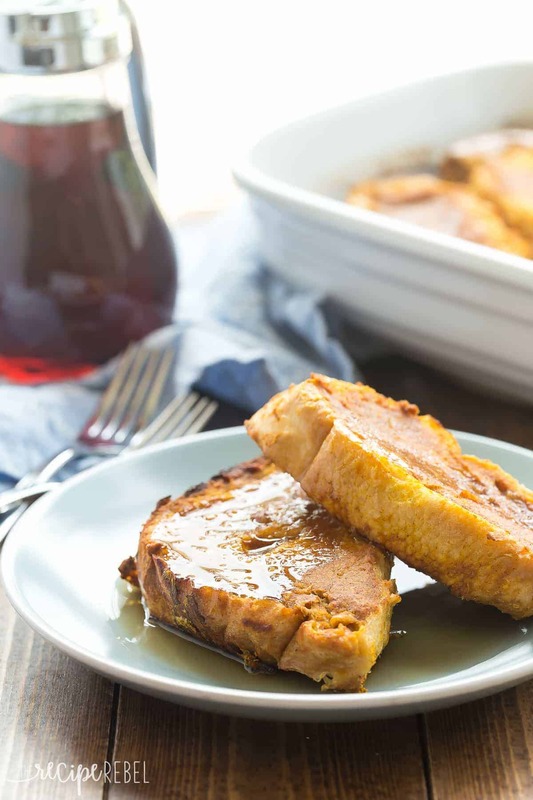 This Overnight Pumpkin French Toast is so easy — you can make ahead for holiday gatherings and brunches and bake together in one pan! Place French bread in a single layer in a well-greased 9×13″ pan. Pour egg mixture evenly over top. Flip bread and move it around the pan to try to get the egg mixture evenly distributed. How thick should I slice the frech bread? 1″ slices or thicker? I do about 1″, yes! I’m a little confused. It says to flip the bread when you take it out of the fridge. Then in the instructions for a regular oven it says to check it when you flip it at the 15 minute mark? Do I flip it twice? Won’t it fall apart if I flip it when it is half baked? Hi Linda! It shouldn’t fall apart, no. I flip it during baking so that both sides get equally toasted. Let me know how you like it! Hi Karen — you just have to click “get the recipe” and you will find the recipe. why don’t more people give their comments after they have cooked the recipes?!! I would love that! You are definitely welcome to add yours after you try something. i love everything about French and i love this, too. it’s great for a cool fall morning. it;s never too soon for pumpkin. TWO QUESTIONS: 1) Before I put this cold glass baking dish I just took out of the fridge, do I put it in a pre-heated oven? Will it break if it’s cold or do I need to let it set on the counter and bring it to room temperature first? 2) If I want to add nuts to this recipe, do I top French toast b/4 I bake it, during, or afterwards? Thank you! Those are great questions! Honestly, I always just put my cold baking dish into the oven and I haven’t had any problems, but if you want to be safe you could pull the pan out while the oven preheats and let it warm up a bit. With the nuts, I would probably add them in the last 10-15 minutes of baking, and then they should just toast nicely! I have a recipe with nuts, butter, and brown sugar for a topping and they are fine on the top for 45 minutes … just cover if the top starts getting too brown. the problem is not putting a cold pan in a hot oven, it is in putting something cold into a hot GLASS pan. when cold hits hot, the glass contracts too rapidly…thus the shattering from drastic temp changes. I have never heard of a steam oven. Can I use my regular oven and at what temperature and how long?? This looks and sounds amazing. Thank you. Yes, absolutely! There is a note with the recipe. I’m just starting to get into the mood for pumpkin. 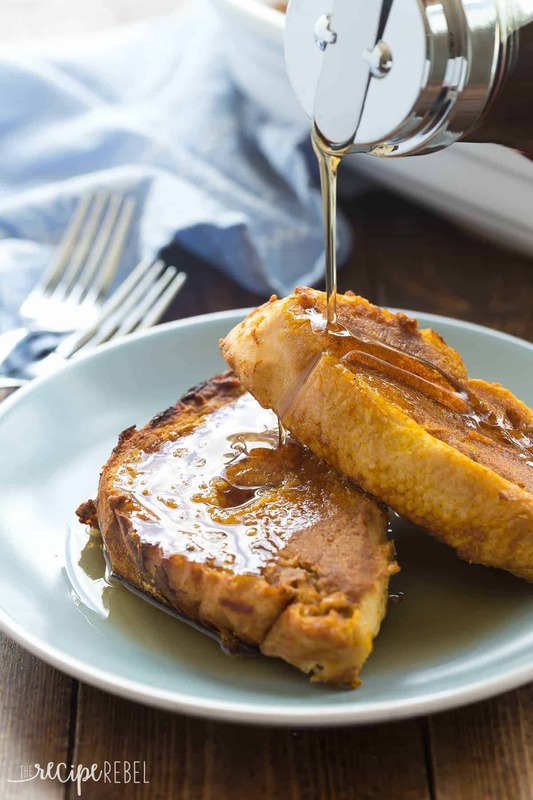 This baked french toast looks like a great way to start off pumpkin season! I’ve yet to start baking/cooking with pumpkin but you’re a burst of encouragement. This French toast sounds so warm and comforting. It will definitely be on my breakfast list once the weather cools a bit. Haha! Call me crazy! Thanks Jen! Haha I am on team pumpkin (never too early) although I will MISS sweet summer fruit 🙂 Love this yummy overnight french toast – so perfect for fall! Tell me about it! I have got my freezer STOCKED (seriously, I almost need a freezer dedicated to summer fruit — Lol! ), but I do love a warm, cozy fall comfort meal! 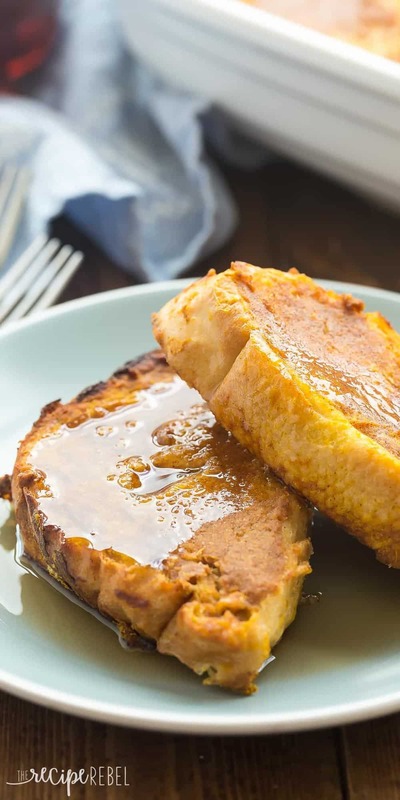 It’s a little early for pumpkin for me too…but man, does this french toast look GOOD! ? This might be just what I need to start slowly easing myself into fall…haha! I totally am with you on the whole pumpkin thing but the people go CRAY CRAY for it so I provide! This looks awesome! God Bless breakfast and God Bless pumpkin season, amirite!? This looks absolutely magical for a cozy Sunday morning. Going on my to-do list now! Yup, people seem ready for the pumpkin!!!! I LOVE this baked-overnight-pumpkin-french-toast!!! it’s gorgeous!!!!! and I’m so intrigued by the Steam Convection Oven!! Thanks Alice! It is So handy — has so many different uses! Ahhhh! You’re getting me seriously SO pumped for pumpkin season, girl! This french toast looks like THE perfect way to kick things off. I’m totally drooling over here and seriously wishing that a plate of this heaven would appear in front of me! Wouldn’t that be nice?!? I’ll admit, I had cereal for breakfast today. But I’m thinking a batch of this needs to happen this weekend! Oh my goodness, this looks fantastic! And I love that it’s a fall recipe :). Yum! assuming you do not have a Steam Convection oven, can you bake it in a regular old oven? And if so how high for how long? Yes, you absolutely can! I would bake for about the same amount of time, but you can always check the bread at the 25 minute mark just to be safe. Lol! I won’t revolt that you are posting a pumpkin recipe right now! Instead, I will be pinning this and bookmarking it for when I’m ready to accept that pumpkins are now apart of my reality. 😉 This french toast looks absolutely DELICIOUS, Ashley! And I LOVE that it is overnight! YES! Pinned of course! Cheers! Haha, I appreciate your understanding Chey! I will be ready with alllll the fall recipes when you are ready! 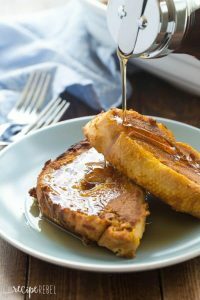 I am so craving pumpkin and this french toast looks like the perfect way to enjoy it!! It’s never too soon for pumpkin! I just shared my first apple recipe today, so I’m on the same wavelength. Bring on the fall recipes! This french toast looks incredible, Ashley! I’ve never tried a version like this before. Sounds perfect for cool fall mornings! Thanks Gayle! I saw your caramel apple — looks SO good! The weather has been MUCH cooler here and it definitely feels like fall, so I don’t feel weird at all thinking about it. The mornings and evenings are so cool, it’s definitely sweater/pumpkin/apple weather!